Emerald Without pity, its sharp claws destroy foes. If it encounters a strong enemy, it becomes agitated, and the flame on its tail flares with a bluish white color. Leaf Green When it swings its burning tail, it elevates the air temperature to unbearably high levels. Diamond/Pearl In the rocky mountains where CHARMELEON live, their fiery tails shine at night like stars. 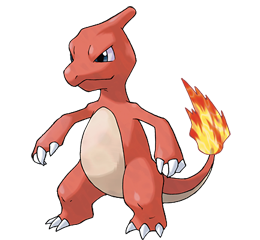 Platinum In the rocky mountains where CHARMELEON live, their fiery tails shine at night like stars. Heart Gold It is very hotheaded by nature, so it constantly seeks opponents. It calms down only when it wins. Soul Silver It has a barbaric nature. In battle, it whips its fiery tail around and slashes away with sharp claws. Black In the rocky mountains where Charmeleon live, their fiery tails shine at night like stars. White In the rocky mountains where Charmeleon live, their fiery tails shine at night like stars.